The Honda Grom created an odd but amusing segment of motorcycling when it was introduced in 2014. Big enough to ride on real roads, small enough to thrash like a borrowed bicycle. Apparently it still has enough fans to stick around, and is getting a few tweaks for the 2017 model year. The 2017 Grom will start selling at $3,199 in August of this year, about a $200 bump from its intro price. That will make it just a little pricier than Kawasaki’s new Z125 Pro, which will rival the Honda in the “itty bitty awesome” category. The bike will still be rocking the same 125cc thumper (single-cylinder four-stroke engine) that Cycle World dyno’d at 8.96 horsepower in 2013. It’s also running the same 31mm inverted fork, single rear 4.1-inch travel shock, hydraulic disc brakes, and steel frame creating the same 225 pound curb weight, 47.4-inch wheelbase and 30-inch seat height that everybody seems to fall in love with shortly after throwing a leg over. 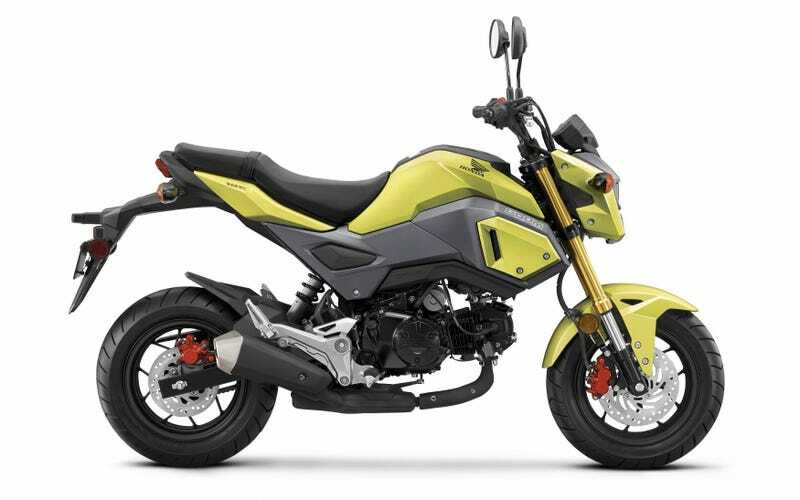 So what exactly is “new” about the new Grom? I think I see some new red brake calipers on there too. Relocating the exhaust exit is the only change I can imagine would affect the bike’s performance. At under 9 horsepower, even a small percentage of output change could be significant so I’ll be interested to see what happens when somebody puts the new bike on a dyno. The main gain is most likely in weight distribution, which should bias a little lower with the pipe exiting by the rear axle. Hang on, was there something about a “passenger seat” up there? Indeed; the Grom’s always had one and apparently Honda has made an effort to increase the comfort of rear-seated riders. Those brave bastards. If anyone’s ever ridden dinky on the back of a buddy’s Grom, please recount the experience in the comments. I gave my girlfriend a lift on my 250 thumper once, and let’s just say she refused to ride anything of mine for a week afterwards. Anyway, the 2017 Grom color options are basically the same as the original bike: Matte Gray Metallic, Pearl Red, Pearl White, and Bright Yellow which looks more like “highlighter” in the picture Honda put out. I’m still waiting for the retro off-road Grom Scrambler to hit the store, but this futuristic trim isn’t bad either.